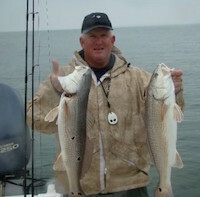 Captain Dan Utley is a 30+ year veteran fishing the near shore and inshore waters surrounding Hilton Head Island, SC, and is a licensed Coast Guard Captain. Redfish are his specialty, but during the correct season the Fishin’ Coach loves to pursue Cobia, Tarpon and other large predatory species (Sharks). To see the Captain Dan in action, check out this episode of the Nuts & Bolts of Fishing & Boating Television show. Fishing techniques range from using dead or live baits on spinning and conventional tackle to artificials and sight fishing with Fly Gear. Techniques vary with the season, tides and weather. Trips are planned ahead of time combining the knowledge and experience of Captain Dan and the interest of clients. Inshore Fishing is done out of a 22′ Century Bay Boat with a wrap-around deck that makes for easy maneuvering for several people. New this winter is a custom T-top with a sighting platform to help spot Redfish and surface cruising Cobia, plus some needed shade for the hot summer months. Having spent 30 years teaching and coaching, Captain Dan has plenty of patience to “Coach Up” the beginning angler, and lots of savvy to challenge the experienced angler. Don’t hesitate to call or E-mail to get in touch with the Fishin’ Coach. The following rates are for inshore fishing in the creeks, rivers, and sounds. Turn Lemons To Lemonade from Omega Media Group on Vimeo. No matter how much planning you do, sometimes Mother Nature throws you a curve ball and you have to implement "Plan B" when you get to your fishing destination. In this episode Capt. Cefus McRae and Capt. Dan Utley, known as the "Fishin' Coach", explore the saltwater fishery near Hilton Head Island, SC in search of schooling redfish, speckled trout, flounder and more. Capt. Dan shares his knowledge on how to catch redfish in changing weather patterns, plus we partner with the SC DNR Redfish Tagging Program to show how it's done and the way they manage this vibrant fishery.